The activation of amino acids and the formation of peptides under primordial conditions is one of the great riddles of the origin of life. where a compound in square brackets symbolises the concentration of that compound. This means that if we start with a concentrated solution of 1 M (mol/l) of each amino acid, the equilibrium dipeptide concentration would be only 0.007 M. Since tripeptides have two peptide bonds, the equilibrium tripeptide concentration would be 0.007² M or 5 × 10⁻⁵ M. For a non-specific polypeptide with 100 peptide bonds (101 amino acids), the equilibrium concentration would be 3.2 × 10⁻²¹⁶ M. NB: the problem for evolutionists is even worse, because life requires not just any polymers, but highly specified ones. Since the equilibrium concentration of polymers is so low, their thermodynamic tendency is to break down in water, not to be built up. The long ages postulated by evolutionists simply make the problem worse, because there is more time for water’s destructive effects to occur. High temperatures, as many researchers advocate, would accelerate the breakdown. The famous pioneer of evolutionary origin-of-life experiments, Stanley Miller, points out that polymers are ‘too unstable to exist in a hot prebiotic environment’.2,3 A recent article in New Scientist also described the instability of polymers in water as a ‘headache’ for researchers working on evolutionary ideas on the origin of life.4 It also showed its materialistic bias by saying this was not ‘good news’. But the real bad news is the faith in evolution which overrides objective science. ΔG₃ = ΔG₁ + ΔG₂. If ΔG₃ is large and negative, the equilibrium constant for reaction 3, K₃, will be large, and this could conceivably produce reasonable quantities of polymers. Organic chemists can certainly make polypeptides, using intelligent planning of a complex multi-stage synthesis, designed to prevent wrong reactions occurring.11 Living cells also use an elegant process to make polypeptides. This involves the use of enzymes to activate amino acids (and nucleotides) by combining them with the high-energy compound ATP (adenosine triphosphate), to overcome the energy barrier. Such high-energy compounds are not formed in prebiotic simulation experiments, and are very unstable. To form a chain, it is necessary to react bifunctional monomers, that is, molecules with two functional groups so they combine with two others. If a unifunctional monomer (with only one functional group) reacts with the end of the chain, the chain can grow no further at this end.12 If only a small fraction of unifunctional molecules were present, long polymers could not form. But all ‘prebiotic simulation’ experiments produce at least three times more unifunctional molecules than bifunctional molecules.13 Formic acid (HCOOH) is by far the commonest organic product of Miller-type simulations. Indeed, if it weren’t for evolutionary bias, the abstracts of the experimental reports would probably state nothing more than: ‘An inefficient method for production of formic acid is here described …’ Formic acid has little biological significance except that it is a major component of ant (Latin formica) stings. A realistic prebiotic polymerisation simulation experiment should begin with the organic compounds produced by Miller-type experiments, but the reported ones always exclude unifunctional contaminants. In their latest well-publicised experiment, Huber and Wächtershäuser activated amino acids with carbon monoxide (CO) and reacted them in an aqueous slurry of co-precipitated (Ni,Fe)S using either hydrogen sulfide (H₂S) or methanethiol (CH₃SH) at 100° C at a pH of 7–10. Even under their favourable conditions (due to intelligent design! ), all they produced was a small percentage of dipeptides (0.4–12.4%) and an even tinier amount of tripeptides (0.003%)—calculated from reported quantities. Huber and Wächtershäuser also reported that ‘under these same conditions dipeptides hydrolysed rapidly’! The exclusive ‘left-handedness’ required for life7 was destroyed in the process. They excuse this by pointing out that some cell wall peptides have right-handed amino acids. But this misses the point—enzymes that break down cell walls are designed for exclusively left-handed amino acids, so an occasional right-handed amino acid is the perfect defence in a left-handed world. A final irony is that one of their previous experiments converted CO into acetic acid (CH₃COOH) under similar conditions with CH₃SH and a (Ni,Fe)S slurry.17 Since acetic acid is unifunctional, this would prevent long polymers from forming under the conditions Huber and Wächtershäuser propose! 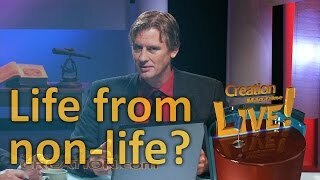 Did scientists create life, or did the media create hype? If true, then this would be remarkable. Even the simplest decoded free-living organism, Mycoplasma genitalium, has 482 genes coding for all the necessary proteins, including enzymes. These proteins are composed of about 400 amino acids each on average, in precise sequences, and all in the ‘left-handed’ form.19 Of course, these genes are only functional with pre-existing translational and replicating machinery, a cell membrane, etc. But Mycoplasma can only survive by parasitizing more complex organisms, which provide many of the nutrients it cannot manufacture for itself. So evolutionists must postulate an even more complex first living organism with even more genes. However, as shown above, all Huber and Wächtershäuser produced were a few dipeptides and even fewer tripeptides. While they didn’t make the deceitful claim quoted above, their evolutionary faith means that they see far more significance in their experiment than it deserves. The next day, the same newspaper wrote ‘WA Museum evolutionary biologist Ken McNamara said if life could be created artificially, it could emerge naturally given the right conditions.’20 How absurd—does this mean that because we can create cars artificially (with loads of intelligent input), it proves they could emerge naturally (without intelligence!)? A detailed survey of the political and social beliefs of producers, editors, writers, and staff in the television industry26 shows that they are biased against Christian morality. Two-thirds of them believe the structure of American society is faulty and must be changed. 97% say women should have the right to decide whether they want to have an abortion, 80% believe there’s nothing wrong with homosexual relations, and 51% see nothing wrong with adultery. And they openly admit that they push their ideas into the programs they create for their audiences. The media’s willingness to push evolutionary hype is consistent with their anti-Christian stance. Despite over-optimistic science reports and very biased and hyped-up media reports, scientists have not even come close to ‘creating life in the test-tube’. Even if they do manage this feat, it will be the result of intelligent design. Ordinary undirected chemistry moves in the wrong direction—for example, as shown in this article, biological polymers tend to break apart, not form. Creation in-depth: Proteins from random amino acid chains? Huber, C. and Wächtershäuser, G., 1998. Peptides by activation of amino acids with CO on (Ni,Fe)S surfaces: implications for the origin of life. Science 281(5377):670–672. Return to text. Miller, S.L. and Lazcano, A., 1995. The origin of life—did it occur at high temperatures? J. Mol. Evol. 41:689–692. Return to text. Miller has also pointed out that the RNA bases are destroyed very quickly in water at 100°C—adenine and guanine have half lives of about a year, uracil about 12 years, and cytosine only 19 days. Levy, M and Miller, S.L., 1998. The stability of the RNA bases: Implications for the origin of life. Proc. Natl. Acad. Sci. USA 95(14):7933–38. Return to text. Matthews, R., 1997. Wacky Water. New Scientist 154(2087):40–43. Return to text. Fox, S.W. and Dose, K., 1977. Molecular Evolution and the Origin of Life, Marcel Dekker, New York. Return to text. Glycine, the simplest amino acid, is by far the commonest amino acid formed. See Ref. 13 for some typical yields. Return to text. For more information on chirality and life, see Sarfati, J.D., 1998. Origin of Life: The chirality problem . Journal of Creation 12(3):263–266. Return to text. Such criticisms and more are found in Thaxton, C. B., Bradley, W. L. & Olsen, R. L., 1984. The Mystery of Life’s Origin, Philosophical Library Inc., New York. See online version (off site). Return to text. Steinman, G., Kenyon, D.H. and Calvin, M., 1966. Biochim. Biophys. Acta 124:339. D.H. Kenyon, also co-author of the evolutionary book Biochemical Predestination, has since become a creationist. Return to text. Gish, D.T., 1972. Speculations and Experiments Related to Theories of the Origin of Life: A Critique, ICR Technical Monograph No. 1, Institute for Creation Research, San Diego, CA. Return to text. Streitwieser, A. and Heathcock, C.H., 1981. Introduction to Organic Chemistry, 2nd Ed., Macmillan, NY, ch. 29. Return to text. Volmert, B., 1985. Das Molekül und das Leben, Rowohlt, pp. 40–45. Cited in: Wilder-Smith, A.E., 1987. The Scientific Alternative to Neo-Darwinian Theory: Information Sources and Structures, TWFT Publishers, Costa Mesa, CA, p. 61. Return to text. Dickerson, R.E., 1978. Chemical Evolution and the Origin of Life. Scientific American 239(3):62–102. A chart on p. 67 shows a typical yield from one of Miller’s experiments. 59,000 mmol carbon in the form of methane yielded as the main unifunctional products: 2,330 mmol formic acid, 310 mmol lactic acid 150, mmol acetic acid and 130 mmol propionic acid. Four amino acids found in modern proteins were produced: 630 mmol glycine, 340 mmol alanine, 6 mmol glutamic acid, and 4 mmol aspartic acid. Return to text. Horgan, J., 1991. In the beginning. 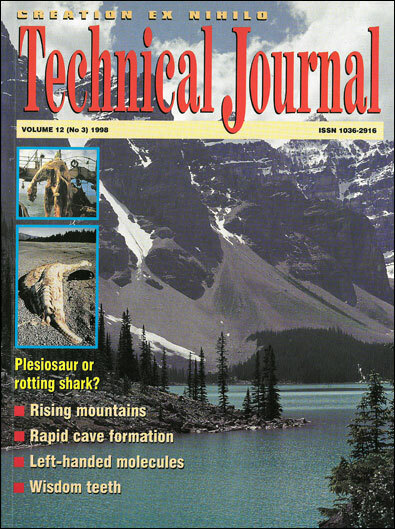 Scientific American 264(2):100–109. Quote on p. 106. Return to text. Horgan, ref. 14, p. 102. Return to text. Vogel, G., 1998. ‘A sulfurous start for protein synthesis?’ Science 281(5377): 627–629 (Perspective on Ref. 1). Return to text. Huber, C. and Wächtershäuser, G., 1998. Activated acetic acid by carbon fixation on (Fe,Ni)S under primordial conditions. Science 276(5310):245–247. Return to text. The West Australian, 11 August 1998. Return to text. Fraser, C.M., et al. 1995. The minimal gene complement of Mycoplasma genitalium. Science 270(5235):397–403; Perspective by A. Goffeau. Life with 482 Genes, same issue, pp. 445–6. Return to text. The West Australian, 12 August 1998. Return to text. Scott, E.R.D., Yamaguchi, A. and Krot, A.N., 1997. Petrological evidence for shock melting of carbonates in the martian meteorite ALH84001. Nature 387:377–379. Return to text. Bradley, J.P., Harvey, R.P. and McSween, H.Y., 1997. No ‘nanofossils’ in martian meteorite. Nature 390(6659):454–456. Return to text. Holmes, R., 1996. Death knell for Martian life. New Scientist 152 (2061/2):4. Return to text. Kerr, R.A., 1998. Requiem for life on Mars? Support for microbe fades. Science, 282(5393):1398–1400. Return to text. Bradlee, B., 1989. Reported by Brooks, D., 1989. The Wall Street Journal, 10 October. Return to text. Lichter, S.R., Lichter, L.S. and Rothman, S., 1992. Watching America: What Television Tells Us About Our Lives. Return to text.